What is the most memorable event you’ve attended? We ask new seminarians this question so folks can get to know them by reading our website or the vocations magazine (“Ave Crux” -- still on sale!...just kidding, still free and available on our website). If you had asked me what my most memorable event was 23 years ago, I would have said “my brother Bill’s priestly Ordination.” But then came my own First Profession, Final Profession, diaconate Ordination, and priestly Ordination, as well as installation as pastor of my home parish. Those were all memorable events! And later on it was concelebrating Mass with Pope Benedict XVI at Washington Nationals Stadium in 2008. Then there was being in Saint Peter’s Square for the opening of the jubilee door for the Year of Mercy in 2015. 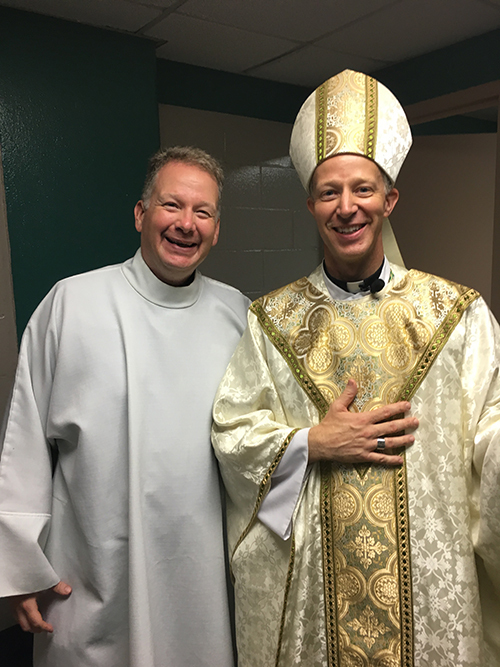 Now I have a new answer, because I attended my brother’s Episcopal Ordination on August 22nd in Pensacola, Florida. I was bursting with pride and joy, and I still am. In fact, the whole experience gave me some inkling of what Saint Peter wrote of in his first letter, for it truly was “an indescribable and glorious joy” (1 Peter 1:8). Bill is now the bishop for most of the Florida panhandle, and there is no doubt in my mind that he will do a wonderful job as a shepherd of many souls. Honestly, I can’t imagine anything topping this moment! It was amazing beyond words to see my big brother being ordained a bishop, praying with our parents and most of our large family, with the Congregation of Holy Cross, as well as many other priests, deacons, religious, and thousands of others. So can that moment of the Ordination be topped? Even though I can’t imagine it, I’m quite sure there will be something more memorable down the road. That’s the way God works…He gives us amazing experiences that seem “unstoppable”, and then He tops them when we encounter Him in our prayer, in gatherings of family and friends, and in wonderful moments of love and mercy. When we think He can’t love us more, or forgive us more, or amaze us more, He tops those moments with ease. In fact, every time we receive Jesus in the Eucharist, we encounter Him in a personal and beautiful way, and what could be more memorable than that? During this month of September, let us turn to our Blessed Mother Mary, our Lady of Sorrows. She followed Jesus through the joys and sorrows of His life, passion, death, and resurrection in many memorable events. She is the perfect example of how we are called to live, and to love – to sit at the feet of the Master to learn from Him, to ponder the lessons in our hearts, and then to go out into the world and to proclaim the Gospel. Along the way we will continue to have moments that are memorable, so long as we continue to give our will to the Lord. As people of faith, He will show us greater things than we can possibly imagine!